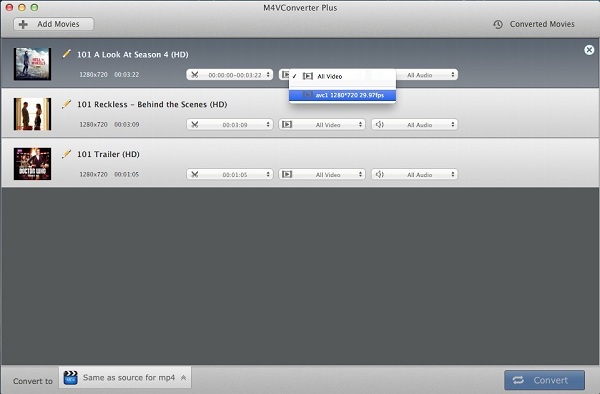 As a powerful m4v converter tool, there are several output formats to select, just according to the need, Click to choose the right output formats. The profile displays a variety of mobile devices, and each device has one or more popular output formats such as MOV, MP4, AVI, FLV, SWF, 3GP and so on. 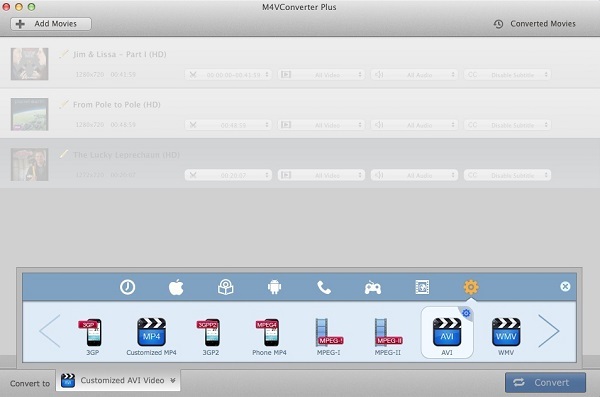 Click the time setting box then choose Custom option, input the Begin and End time to convert the clips which you want. Tips: If the original video has chapters, you can choose the single chapter which you want to convert. The default Video Setting is All Video, but you can also choose the other two options Disable Video, avc1. Disable Video: The output file has no video, just audio. avc1: The video size of the original file, and it is the same as All Video. The default Audio Setting is All Audio, but you can also choose the other options Disable Audio, mp4a. All Audio: For multi-language video files, the output file can keep all the audio tracks. Disable Audio: The output file has no audio, just video. mp4a: The audio track of the original file, for multi-language video files, it will show all the audio tracks individually.